If our audiologists at the New Hampshire Hearing Institute (NHHI) determine that you would benefit from a hearing instrument, they will review all the available options with you, and help you select a device that best meets your specific hearing and listening needs. Once you have ordered your hearing aids and they have arrived in the office, we will contact you to schedule a fitting. At the time of fitting, our audiologists will digitally program your hearing aids, customizing them to meet your specific needs (fitted to match your prescription). They will also go over the use, care, and basic cleaning for your devices. If you ever have issues with operation of your devices or need adjustments, please contact our office to schedule a follow up appointment. Hearing aids need to be cleaned on a regular basis, because ear wax and debris buildup within the hearing aid(s) over time. If you are unable to clean your hearing aids yourself, please schedule an appointment to bring them in for a professional cleaning. Generally, we can fix most hearing aids made by most manufacturers, including but not limited to Phonak, Oticon. 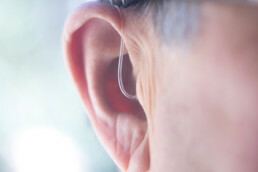 We cover basic repairs, including ear wax and debris removal within the hearing aids. Excess ear wax and debris can cause damage to internal parts. With proper cleaning and care, these basic repairs can be avoided. Most new hearing aids come with a warranty that covers repairs, and generally the warranty period is for 3 years, but some are for 2 years. The actual time period depends on the manufacturer. If you ever have questions about your warranty, please don’t hesitate to contact us. If you have any further questions about the hearing aid services we provide, please give NHHI a call at (603) 792-4327 to make an appointment.